After a fantastic 2010, we�ve got another great year of riding events planned. To get the earliest notifications about each event, use the link at the top left of this page to subscribe for free if you�re not already a subscriber to Sound RIDER! If you see an event you want to participate in, be sure to mark it on your calendar now and arrange your vacation time accordingly. The Rally in the Gorge � has it got nine lives? You bet! Since 2003 we�ve run this rally in the Columbia River Gorge and the more we run it the better it gets. If you have not been, you�re missing out on five days and four nights of too much fun. An organized rally that covers a lot of ground, we run separate programs for the four styles of bikes noted above, thus each gets their own mini rally. And of course you can migrate into the other dimensions at any time. We have a number of riders who arrive with a truck hauling a sportbike and dual sport bike, or some other combination. During the day, we have suggested rides, clinics and seminars and the evenings fill up with on-stage entertainment, our auction and various entertainment pockets throughout the fairground depending on what each vendor wants to offer themselves. This year highlights include the return of Nick Ienatsch, a return appearance from David Hough (you didn�t think that little boo-boo out on Highway 14 is gonna keep him away), an all-new ride on the northern slopes of Mt. Hood, a Maryhill Cornering Clinic that will focus on trail braking and will be taught by Bret Tkacs and Nick Ienatsch together, a dual sport clinic designed to showcase proper technique on iffy surfaces (we�ve been hiding them from you but we know where they are) and a lot more. The rally is once again the Northwest Regional Rally event of the American Motorcyclist Association. Look for registration to open in February with special rates for those who sign up early and those who attended last year�s rally. As you know, we hold several events, rides and tours throughout the year. All of these events will fall under the 2011 Sound RIDER! Grand Tour Series. With each event you participate in, you�ll amass points. The more you do, the more points you�ll score and prizes will be awarded to those who reach particular point levels. The points and levels are still being determined and we�ll have details in the March issue. This comes about by virtue that a lot of people attend more than one event of ours each year and it�s a chance for us to reward their loyalty. For this tour, riders are provided with a tour sheet outlining 15 restaurants in the Northwest. You must hit as many as you can over the six-month period. The more you hit, the higher your score. When you dine at them, you get additional points. There is no rush to hit them all in a short period of time; relax, plan out some great routes and start eating your way to the top. Restaurants are selected by our editorial staff and our sister publication, Seattle DINING!. Those who have done this in the past know we know where the good food is. The theme for this year�s ride is "At The End Of The Road." We choose the theme based on the fact that all the restaurants this year are at the end of a road. In fact, you�ll need to use an additional means of transportation (provided at the sites) to dine at several of the locations. It�s gonna be scenic, it�s gonna be fun, it�s gonna have a lot of great corners and it�s gonna taste so good. Look for registration to open when we publish the April issue. All types of bikes are welcome in this event. Our Road Trip tours are designed to get you down some tertiary roads you might not otherwise ever know about or ride. At times you�ll feel like you�re in a foreign land. The idea of an interstate or heavily traveled road does not play into our route plans. For the most part, the roads we choose aren�t heavily traveled and have a boonies-like quality to them. That means more corners, cool little out-of-the-way places, interesting sights � and then more corners. We learned a lot from our first Road Trip tour last year. We know you like the endless twisties we build in, but you�d like a little more time to relax and not have to pack up and move each day. So here�s how this year�s tour will play out. We�re going to start in Eastern Oregon and wind our way to a medium-sized town where we�ll spend two nights. Day two will provide several loop rides you can choose from and then it�s back to the same town that night. Day three we pack up and ride to a very small town in Idaho, where we can groove into our accommodations and stay another two nights. Day four will feature, again, a selection of loop routes and then back to our small town accommodation from the night before. Day five we ride home and if you�re returning to the Puget Sound region, we�ve got a stunning back roads route back. For both overnight locations, you will have your choice of several motels and/or camping. Final details will be issued in the March issue. While the tour runs Monday through Friday, most people will have an additional two weekend days before the tour and three with the labor day holiday on the backside. Oh wow � 10 days to do nothing but ride in the Northwest! That�s awesome. All types of bikes are welcome in this event. A near sell-out crowd on the 2010 Sasquatch Dual Sport tour means � of course � we�re doing it again. 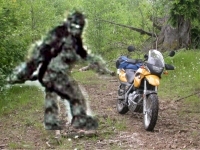 A simple search engine lookup of "Sasquatch Dual Sport" tells the tale of the past with videos, forum posts and otherwise. Bob and I are hard at work running route scenarios for 2011. Here�s what we know so far. Oregon is a great place and we�ll be back � but not this year. Canada sounds dreamy, but since most of its gravel routes are heavily used for logging on the weekdays, it�s not in the cards. Washington � hey now there�s an idea. However our idea is to explore some places that are truly destination locations. Places you can�t get to without making a special trip to get there and thus don�t work as a day ride. To accomplish this route task there may be a moment or two of blacktop boredom, but when you�ve finished the ride you�ll look back and say �Wow � I�m glad I did this!" The plan is to start up high and end high. How we will do it will be our secret until you join in. As I said before, if you�re not on our newsletter list � use the link at the top left of this page to get on it for free.